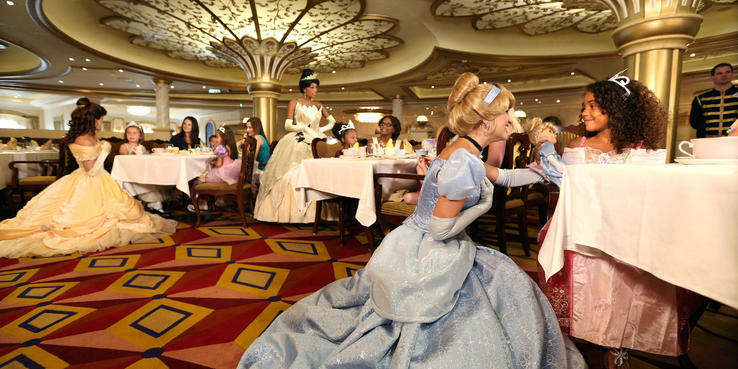 The dining experience on Disney Wonder is themed, much like everything else onboard. The soft-serve station isn't just ice cream. It's Eye Scream, inspired by Mike, a character from "Monsters, Inc." Opposite Eye Scream is Sully's Sips, a smoothie station featuring another main character from the film franchise. Cabanas, the buffet, is bright with beach blanket-colored umbrellas and napkins. New-to-the-fleet Tiana's Place transports cruisers to the French Quarter of New Orleans for a jazzy supper club experience straight out of "The Princess and the Frog." And Triton's and Animator's Palate, the other main dining rooms, take you under the sea and behind the scenes of your favorite animations, respectively. Even Palo, the adults-only specialty restaurant, eschews the traditional Italian ambiance to specifically transport you to the romance of Venice. Palo aside, which is the only restaurant with a surcharge onboard Wonder, we felt the quality of the food and drink was masked by the better atmosphere and entertainment. Many of our dishes were just OK, and some menu offerings lacked cohesion (lunch one day in Triton's offered chilled duck breast or buttered green asparagus for appetizers, which felt a little old-fashioned). Don't get us wrong, we loved the authentic Southern flavors in Tiana's, with shrimp and grits or Cajun sea bass. But mealtime diversions like a live band, video screen animations and parades of pirates distracted from the mediocrity of the food offered in all the main dining venues. With that said, unless you are a self-proclaimed "foodie," the offerings at the buffet or on the dinner menu, should be sufficient -- you'll be too busy tending to the kids or lost in the state-of-the-art smoke and mirrors to notice otherwise. Plus, children, who make up a third of all cruisers onboard, are not likely to mind the quality of the food as they dive into their chicken nuggets or cheeseburgers. To make it easier for kids to choose, Disney offers a separate kids' menu, which varies by the day of the week. The dining on Disney is rotational, meaning passengers rotate through the three main dining rooms over the course of their cruise. The best part about the schema is servers rotate with you, remembering details like drink orders and building a report with the kiddos; just two reasons this setup works well for the cruise line. The order of your rotation is delivered on a ticket to your cabin (along with the date and location of your Character Breakfast, where Mickey, Minnie, Goofy and the gang, stop by each and every table for photos and to sign autographs). The order of restaurants is also abbreviated on your Key to the World cruise card. Regarding dietary restrictions, Disney takes them very seriously. A tablemate with a gluten allergy was presented with his own bread each evening, and his order was taken on a special slip, so it would never be confused with other meals. It's best to mention any allergies or preferences to your servers on the first night; we found these requests were handled with precision. Symbols on all menus designate gluten- and dairy-free items. Two additional Disney dining perks include free sodas during meals at these restaurants (as well as at the self-service beverage stations on the pool deck), along with a different children's menu/activity sheet each night, filled with fun word games, a coloring sheet and maze. There are three main restaurants on Disney Wonder, each offering a different set menu. However, an always-available menu of grilled sirloin steak, roast chicken breast, baked salmon and another light option are offered nightly in all three. Seatings are at 5:45 or 8:15 p.m. every night for all main dining venues. Breakfast and lunch are available every day as a buffet in Cabanas or a la carte in Triton's Palace. Light morning and afternoon snack options are offered at Daisy's de Lites on the Lido Deck. Tiana's Place (Decks 3): The concept of a New Orleans' supper club is playfully executed in the dinner-only Tiana's Place, a main dining room that draws inspiration from the Disney film "The Princess and the Frog." A Roaring '20s-styled Tiana welcomes you and acts as hostess for the evening. She's exuberant -- chatting and taking photos with guests and singing and dancing with the band. Speaking of the music, the three-piece band (accompanied on piano for a few numbers) is genuinely enjoyable, playing Disney songs in a style you could expect to find in a jazz club. The volume got a bit loud at times, but it adds to the overall atmosphere, which is lively. Diners receive streamers, which they used as they swayed to music, danced in front of the stage or cheered on the performers. During the main course, a parade (known as a Second Line in New Orleans) starts up, and everyone joins in. The meal is a solid two-hour affair, so make sure little ones take their naps beforehand. New Orleans-themed cocktails and a rum-tasting flight are offered. We appreciated that the beers are actually Louisiana based, including a favorite, Abita. All kids' nonalcoholic cocktails can be served with a glowing Raymond the firefly from "The Princess and the Frog." As always, you'll find Disney in the details: Pay attention to the plates throughout the course of your meal; take a look at the wall behind the serving station if you get a chance and give your dessert menu a second look (or touch). Triton's (Deck 3): Named for King Triton, the father of Ariel in "The Little Mermaid," this underwater-themed main dining room does triple duty as the place to enjoy a sit-down breakfast (8 to 9:30 a.m.), lunch (noon to 1:30 p.m.) and dinner. Metalwork on the windows and chair backs echo the trident held by the king of the sea, but the most impressive feature is a mural of Triton and Ariel along the back wall of the restaurant that consists of about 200,000 Italian mosaic tiles, which amazingly took just five days to install. Breakfast has plenty of coffee, tea and juice, pastries, egg dishes (including eggs Benedict), cereals, fruit and even blended yogurt parfaits that are more like smoothies. A waffle sandwich stuffed with dulce de leche is available for the indulgent, buckwheat crepes for the health conscious. The kids' menu is creative; we were tempted to order the pancake with peanut butter swirl and jelly drizzle. Unlike the other main dining venues, the menus in Triton's rotate daily for lunch and dinner, and also feature nightly themes like island fusion, French and Pirate Night. Along with the bread service, there's always a choice of about four appetizers, soups and salads, and five main courses, with two vegetarian options. Mateys can expect apps like shrimp cocktail or crab cakes and entrees like a cilantro-marinated Caribbean grouper, a lamb shank or jerk chicken. Specialty themed cocktails are recommended for the adults (the Captain's Treasure includes Absolut Mandarin, Peach Schnapps and orange juice). On Pirate Night an impressive six desserts were on the menu, from banana bread and rum-soaked chocolate cake to an ice cream sundae and macadamia cheesecake tart. Lunch fare was OK; the day we dined at Triton's we got a small Reuben sandwich with potato chips, and a hamburger that we probably could have made better ourselves on our backyard grill. The other offerings were eclectic, from salad nicoise to tamarind-glazed beef kebabs. As with dinner, the lunch menu is divided into appetizers, entrees and desserts. Animator's Palate (Deck 4): Animator's Palate is also part of rotational evening dining, and is only open for dinner. The experience here can require a little work; depending on the "show" for that evening (there are two options, depending on the length of the cruise), you might be asked to draw a figure, which ends up animated on the video screens ringing the restaurant by the end of the night. The restaurant is a blank palate, so to speak, with sketches of Disney characters on the walls, chair backs that resemble the buttons on Mickey's pants and giant pillars of paintbrushes -- all awash in black and white. Screens in picture frames play food-themed clips from Disney films and shorts throughout the years. Classic Disney attention to detail includes butter knives that look like palate brushes, plates and cups lined with film strips and menus that move -- you'll see what we mean. For adults, the meal comes with a preset appetizer sampler -- smoked duck breast, pickled onions, shrimp salad, smoked salmon tartar and more accoutrements -- along with a tomato, spaghetti and meatball soup. Popular entrees are beef Wellington and chicken schnitzel. A vegetarian entree includes sesame-crusted, sweet-and-sour tofu. The celebration cake -- layers of cheesecake with vanilla cream and strawberries -- is a sweet end to the meal. Cabanas (Deck 9): The buffet onboard is at the back of the ship, and has plenty of places to sit; seating is also offered outdoors overlooking the wake. If you've sailed a Disney ship before, you'll recognize the buffet, which is now a uniform setup fleetwide. One long counter wraps around the buffet, eventually repeating food stations on the other side. Breakfast, lunch and dinner are served here, with premade omelets, fruit, sugary cereal, bacon and Mickey-shaped waffles in the morning; fish with Caribbean salsa, a carving station, macaroni, a salad bar, Indian dishes and more can be found in the afternoon and evening; a dessert counter is only available during dinner hours. One lunch there was a crepe station with plenty of delicious dessert fillings. Another night, an ice cream sundae bar was open from 10:30 to 11:15 p.m.
Pinocchio's Pizzeria (Deck 9): You can grab a slice just behind Goofy's Family Pool. Choose from thin-crust pepperoni, Hawaiian, vegetable, plain and other pizzas. Pinocchio's is open 11 a.m. to 6p.m. and then again from 9:30 p.m. to midnight for late-night munchies. Pete's Boiler Bites (Deck 9): Located in front of the water slide, Pete's is where you can grab a burger, hot dogs, fries or chicken tenders, from 11 a.m. to 6 p.m. Fish and veggie burgers are also available. Daisy's de Lites (Deck 9): Located just outside of Cabanas, Daisy's offers light grab-and-go snacks throughout the day, including pastries and an oatmeal bar in the morning (from 7 to 9 a.m.), and salads and gyros in the afternoon (from 11 a.m. to 6 p.m.). Room Service; a la carte: The room service menu is a bit hidden -- it's inside a hardcover book about the ship that you can find on the desk in your stateroom. Inside you'll find complimentary items like soup, salad, a cheese plate, chicken wings, hot dog, hamburgers, pizzas, cookies and sandwiches. Snacks like popcorn, cashews and M&Ms are available for purchase, along with drinks. A small cash tip upon delivery is appreciated by crew members. Palo (Deck 10); $30 per person (dinner or brunch): Greeted by gorgeous Venetian masks, adults can escape for a date night at Palo, the only adults-only, extra-fee restaurant onboard. The decor is subtle, with lantern lighting and pillars that look like gondola poles (from which the venue gets its name). The food is Northern Italian in style, and doesn't disappoint. Be sure to peek into the intimate private dining room for 14 tucked away in the back of the restaurant; here you'll find a gorgeous wall-sized mosaic of a gondolier in Venice. The room is typically reserved by groups; however, if it has not been reserved, passengers can come on the day they board and make a reservation, even if with a group smaller than the room can hold. Dinner begins with an antipasti platter arranged tableside by your server. For your appetizer you'll need to choose between crispy calamari with hot peppers and dipping sauces or gnocchi that melts in your mouth, among other choices. Our sea scallop entree came with an additional pour of black truffle sauce and we tried to put it on everything; the Dover sole was expertly deboned -- once again, tableside. Your server will ask if you're interested in the souffle, which takes time to prepare, but it's worth it. We forfeited traditional chocolate for the amaretto flavor on special; it was rich and made even more decadent with the vanilla bean gelato and sauce it's paired with. Other desserts include a limoncello tart. Special touches include a sorbet palate-cleanser topped with a blueberry, a frozen shot of limoncello after your meal and a note the following day from your server, thanking you for visiting. Brunch in Palo is held on a sea day, from 10 a.m. to 12:30 p.m., and is still reserved for passengers 18 and older. Hot items like fish and egg dishes are supplemented with a spread of meats and cheeses. Champagne is also on hand, but costs extra.